Is it possible to have two fantastic brunches in one weekend? Well, yeah! 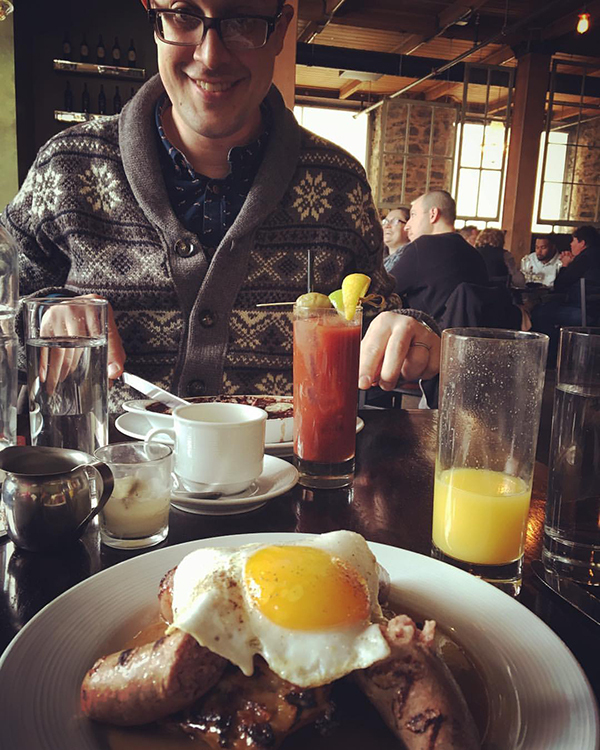 Keeping with our South Wedge circle of delicousness for the weekend, today's brunch was enjoyed at The Cubroom. While McCann's Local Meats (where we ate yesterday)only has brunch on Saturdays, The Cubroom only has brunch on Sunday. Starting at 11:30 to be exact. Did we have to drive around for half and hour waiting for them to open? Yes. The Cubroom opened in the Spring last year and the owners are from NYC. It is said that it is modeled after the Stork Club which explains the environment which is a little more upscale with a Great Gatsby feel but still comfortable. The menu is very experimental and eclectic. They feature a lot of locally sources items like meat from McCann's. Aaron got Red Wine Baked Eggs - polenta, wild mushrooms, parmesan cheese and I had The Banger - IPA BAners, blue cheese/bacon bread pudding, fried duck egg, Java stout red eye gravy. See what I mean? Not your usual fare. One of the best parts was the Scotch Egg we split as an appetizer. 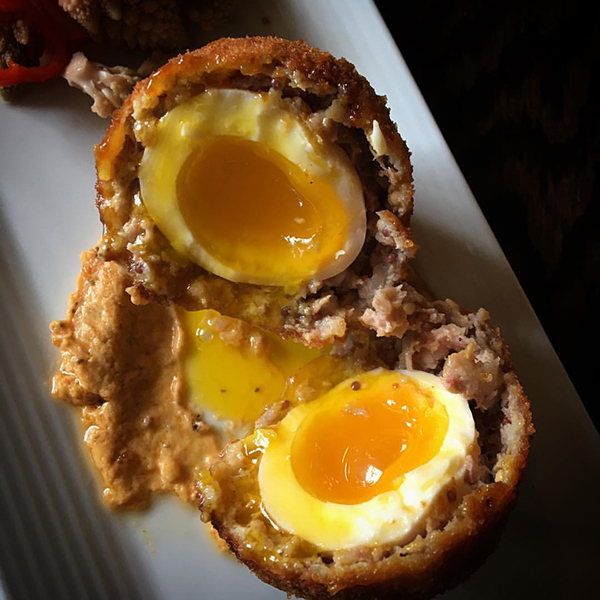 A Scotch Egg is a hard boiled egg, wrapped in sausage, rolled in bread crumbs and baked or deep fried. It starts to make me think of a Turducken. Why stop there? Wrap it in bacon and put it in a pork chop! The Cubroom's Scotch Egg is soft boiled which I loved. I have toyed with the idea of making them at home but they seem difficult. How do you get the sausage to stick to the egg?! Maybe I'll just keep going to The Cubroom to get them.